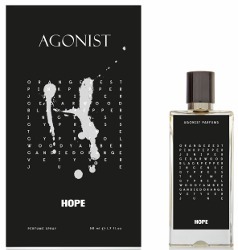 Swedish niche line Agonist Parfums has launched Hope and Nordic Noir, two new unisex fragrances. Hope ~ Fragrance introduced (along with 3 candles) in late 2015. "Meet our exclusive collaboration with the Swedish fashion brand HOPE. An atmospheric and beautiful scent inspired by the inspirational energy and quality of the collaborative efforts from Hope and Agonist. Ingredients from all over the world has [sic] been composed through a clean and light nordic approach. The result is a woody, fresh and very unique energetic scent." With orange zest, pink pepper, juniper, cedar, black pepper, incense, cypress, thyme, cypriol, woody amber, candied orange and vetiver. In 50 ml Eau de Parfum, €125 at Agonist. Nordic Noir ~ "Nordic Noir is a scented tribute to the artistic mystery and beauty of the dark and cold season of the north. The art that grows under the great dark blue skies and the harsh conditions that influence the way we work. The Nordic Noir olfactive pyramid takes its inspiration from hope, longing and light in a sophisticated composition with a woody base of cedar and sandalwood, a heart of orris, mint and fresh ginger roots and it all begins with a captivating top of cardamom and rosemary. The cold Scandinavia has never smelt so good." Additional notes include spearmint, heliotrope, vanilla and musk. $195 for 50 ml at Luckyscent. Nordic Noir piques my interest. I love the ‘cold winter woods’ vibe of CDG Zagorsk and Neil Morris’ Dark Season, so this one is calling to me, at least to sample. I wonder if it will also be available in one of their LE bottles? I could never afford one (sigh), but they are lovely works of art, and I’d love to see what complementary design they’d come up with for this fragrance. It does sound interesting! I am not sure if they are still doing art bottles for every scent…I cannot find a single one for sale on their website, but that doesn’t necessarily mean anything.